Gary W. Edwards’s newly released “Miracle on 14th Street and the Man Who Walks by Faith” is an inspiring story of a true leader who miraculously saves his ministry. “Miracle on 14th Street and the Man Who Walks by Faith” from Christian Faith Publishing author Gary W. Edwards tells the inspiring story about Kenneth D. Cable’s life, from humble beginnings in a midwestern farming community to emerging as an exemplary leader who miraculously saves Manhattan Christian College, in Kansas, from foreclosure when he served as President. 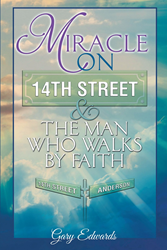 “Miracle on 14th Street and the Man Who Walks by Faith”: a motivational story about Kenneth D. Cable’s life is the creation of published author, Gary W. Edwards. Gary is a 1964 graduate of Lincoln Christian University. He received his masters at Ball State University and completed all classroom requirements for a PhD at Purdue University. Gary has served as a senior minister, campus minister, and Vice President of Manhattan Christian College. He retired as a Vice Chancellor at Purdue University and then became Vice President of Lincoln Christian University. In addition, he founded and served as the president of Dynamic Stewardship Ministries where he raised over one-half billion dollars for the capital stewardship needs of churches. “Miracle on 14th Street and the Man Who Walks by Faith” is the story of Kenneth D. Cable who, like all of God’s children, is uniquely gifted. He was discouraged by three separate high school teachers to consider not going on to an institution of higher learning, yet graduated from two colleges and attended two others. His career included leadership roles in four different Christian organizations. He moved each organization from doubt of purpose and existence, to faith and bold steps forward. The author is honored to have been asked to write his biography. There is no one he holds in higher esteem than this man who walks by faith. Just like one’s legacy will never be able to be measured, all that contributes to one’s life of faith is not quantifiable. But admitting inadequacy, the author hopes his readers try to leave a legacy. Published by Christian Faith Publishing, Gary Edwards’ new book is full of life lessons. Kenneth Cable was born into poverty in 1935 during the dust storms of Oklahoma. He was fortunate to have learned from so many of his mentors while growing up in Oklahoma and Kansas. While still a student at Manhattan Christian College, he became the minister of Glenn Park Christian Church in 1955 where he served until 1972. He took the church from a handful of people to over a thousand members. Kenneth married Phyliss Jean Alexander in 1956, who became his “partner in ministry” for the next fifty-plus years. Kenneth, as always, contributed his success in ministry to his partnership with Phyliss. Kenneth has always been attracted to great challenges. He left Glenn Park and accepted the position of vice president of Christian Missionary Fellowship in Indianapolis. The organization was on the brink of collapse, and Kenneth rejuvenated their mission and raised the support for their continued operation. Today, CMF is a thriving and well-funded missionary-sending organization. His next challenge, he accepted the position of vice president of Friends University in Wichita, Kansas, even though he was told they would probably have to close due to the lack of finances. In less than a year, Kenneth raised the funds to eliminate their debt and underwrite their future. All three of these positions were used by God to prepare him for his greatest challenge, to be the President of Manhattan Christian College. View a synopsis of “Miracle on 14th Street and the Man Who Walks by Faith” on YouTube. Consumers can purchase “Miracle on 14th Street” at traditional brick & mortar bookstores, or online at Amazon.com, Apple iTunes store, or Barnes and Noble. For additional information or inquiries about “Miracle on 14th Street and the Man Who Walks by Faith,” contact the Christian Faith Publishing media department at 866-554-0919.